We’d love your help. 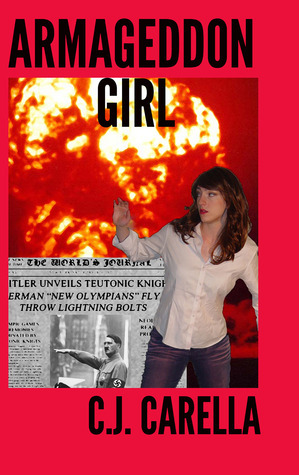 Let us know what’s wrong with this preview of Armageddon Girl by C.J. Carella. College student Christine Dark wasn't happy. Her social life sucked, she spent too much of her time playing computer games or reading sci-fi novels (and the occasional paranormal romance) and she felt like she was missing out on everything. Fate had something special in store for her, though. Without warning, an unknown force drags Christine out of her world and takes her to a whole new universe, an alternate Earth where superhuman beings have existed since the end of World War One. Christine soon learns she too is more than human, and that her choices may save her new home... or bring about its destruction. To ask other readers questions about Armageddon Girl, please sign up. I really liked it a lot!! Superheroes make everything cooler and THAT more epic, but this author writes good characters and plot as well. LOTS of differing POV chapters. Christine Dark is a cillegestudent who prefers to live in her own head and plays a lot of Warcraft.Shes dragged to a frat party by her friend.As expected its a disaster and Christine ends the night on all four on the lawn throwing up.The next thing she know is that something strange is happening to her. She wakes up in a hospital bed before being brutalt kidnapped and then saved by a man named Face off.Only hes not quite just a normal man but a neo-human.Somehow Christine has travel led to another dimension where certain humans develop super powers. I am not a fan of superhero books but I do like the xmen wich I guess is what drew me to this book.Or maybe it was the fact that I had been listening to Taylor Swift "Bad blood" X number of times that day. Its a bit hard to say when a homage or inspiration turns into a fanfic of an already existing universe but this one is skating the edge of that.Its not quite a ripoff but its hard to deny all the similarities. I've never read a superhero book before. I believe the only reason I read this book was because it hadn't been categorized yet as a superhero book on goodreads yet. I was rather disappointed though that I wasn't disappointed like I expected. I definitely enjoyed this book a lot (duh, 5 stars) and might look into reading more books in this genre. The book isn't about Christine as much as revolves around her (different POV every other chapter it seemed). It's probably my only criticism and somethi I've never read a superhero book before. I believe the only reason I read this book was because it hadn't been categorized yet as a superhero book on goodreads yet. I was rather disappointed though that I wasn't disappointed like I expected. I definitely enjoyed this book a lot (duh, 5 stars) and might look into reading more books in this genre. The book isn't about Christine as much as revolves around her (different POV every other chapter it seemed). It's probably my only criticism and something I hope is fixed in the sequel. One of best books I have read in several years. One of the best books in the superhero genre I have ever read! The pacing is fantastic and shifts expertly throughout matching the current point of the plot. The humor is pretty spot on, the characters are believable, inasmuch as they can be in a superhero book, and their emotional experiences are relatable. This is coming from someone who has literally read 2 libraries worth of books since middle school, when found to have reading and comprehension One of best books I have read in several years. A great book, and one that shows just how great small press/self published books can be. The characters were well written, believable, and relative. No mean feat when some of them are basically minor gods. I'm really looking forward to the sequel, I only which I had precognitive powers so I could read it now. So much fun! Christine is at a (super not-fun sounding) frat party that her roommate guilted her into attending when suddenly she gets sucked into another universe... Not only are there superheroes who've created a completely alternate 20th century, but as events progress it becomes clear that she's one of them. An action-packed ride and the tantalizing glimpses of alternate history as well as the overarching reasons behind it are great fun. I'm bummed that the novel ends at what feels like mostl So much fun! Christine is at a (super not-fun sounding) frat party that her roommate guilted her into attending when suddenly she gets sucked into another universe... Not only are there superheroes who've created a completely alternate 20th century, but as events progress it becomes clear that she's one of them. An action-packed ride and the tantalizing glimpses of alternate history as well as the overarching reasons behind it are great fun. I'm bummed that the novel ends at what feels like mostly a lull in the action... then again, it'll be fun to pick up the next one. My one quibble with the book would be that there are a lot of different character viewpoints -- it got a little hard to jump from one person's head to another, particularly as I was much more interested in the main line of the story and less in some of the arch-villains, etc. At the beginning it was a little confusing because there were so many names to keep straight. This was a very pleasant surprise! It appealed to me because out was not only a superhero novel, but the lead is a woman. Thus I was pulled into a first-rate cosmic tale of an alternate reality, multiple styles of storytelling and a heroine funnier than Buffy (which I consider high praise). This focuses on an alternate reality work superheroes, diverging exponentially from WWII, and has several characters reminiscent of (but not copies of) classic comic and pulp heroes. The beginning especially h This was a very pleasant surprise! It appealed to me because out was not only a superhero novel, but the lead is a woman. Thus I was pulled into a first-rate cosmic tale of an alternate reality, multiple styles of storytelling and a heroine funnier than Buffy (which I consider high praise). This focuses on an alternate reality work superheroes, diverging exponentially from WWII, and has several characters reminiscent of (but not copies of) classic comic and pulp heroes. The beginning especially had me laughing (the humor slows down as the story develops and becomes more serious). There are sequels which I am downloading, and I plan to look at other books by the author. Great superhero story with a twist or two. Christine, the nerdy physics major ends up being pulled into an alternate/parallel universe that's a lot like ours - but not quite. Her new universe has Neos, actual superheroes, and they've been mostly around since the 1920s with a few who may have arrived earlier. Power struggles abound and Christine may be the one who can save the day - if things work out just right. With her extreme intelligence, wise-cracking wit, and emerging abilities, she may be Great superhero story with a twist or two. Christine, the nerdy physics major ends up being pulled into an alternate/parallel universe that's a lot like ours - but not quite. Her new universe has Neos, actual superheroes, and they've been mostly around since the 1920s with a few who may have arrived earlier. This has got to be one of my favorite superhero books I've read in a long while. I don't usually enjoy books with a female lead character but Damn if I don't love Christine. I would highly recommend this book. Lots of nerdy in-jokes. Fairly well developed characters, twisty plot, and a heap of ultraviolence. Makes superheroes almost plausible. In the words of Monty Burns. Excellent. I was never a big fan of superhero books but this was really good. A nice fast-paced story that is light and enjoyable. I look forward to the next book. Having just read the first Shadowfall book, which was pretty strong on the worst of HP Lovecraft's pipe dreams, it was a real relief to see snarkiness, affection, and more human emotions portrayed instead. Plenty of action and fantasy opera too. Imperfect very very powerful hero types mixing it up with antl-life forms as well. Great stuff. Will follow this road to see where it goes. The Shadowfall trail, nah. Know where that one goes, and it's just not for me. Good characters. That's what is needed for a good story. Good characters, you get the story from both sides. Even the bad guys are interesting. Longer then most of the unlimited urban fantasy books. I really enjoyed it and will start the next one. I really liked All the non European characters, mint as many of them in most super stories. Started reading this one when it first came out, but couldn't find time to finish it. Found it in the library recently, reread and finished it. Glad I did, as it turns out, this was worth the time, a little rough around the edges, but still a good read. Already bought book two and will take a peak at it. Best I've read in years! Compelling characters, witty dialogue, tight plot. This was a strange one, I almost kinda lost interest in the middle somewhere. But I am glad that I did not. This is definitely a series to follow. Superheroes! How cool is that? Really enjoyed this book. Creative concept. Good characters. Will read more of this series. Okay so I was not all that into this book in the beginning. A lot of characters are introduced and it's slightly confusing. But once I made it past that first few chapters.... Awesomeness! The plot line is very original, the characters are far from typical. Christine is a wicked nerd, and you just gotta love her for it. She admits she rambles when nervous, and makes all types of random references. She really is one of those characters that grows on you. Mark, aka Face-off, is als Wow! Awesome book! Mark, aka Face-off, is also quite a good character as well. I can see the author put a lot of time in developing his personality. I mean, hellllooo, it's a dude without a face.... that's definitely going to change your perspective on life. I'm very excited to continue reading this series! Cool storyline, clever & a bit original. For those that stress over this sort of thing: could really benefit from a good editor. If you can overlook the occasional badly worded sentence, incorrect word or even slips like changes to a character's name, the story itself is good. It's a quick read & leaves you wanting to continue the story. Enjoyable read for anyone that enjoys superhero stories. I liked this book more than I wanted to. Not your typical fantasy/sci-fi story, but an engaging mix of both. Nerds, dorks and gamers will appreciate the subtext more than the muggles, but even the vanilla reader will enjoy. Great start! Love the pulp heroes in the modern setting. Interesting twist on the super hero tale. Feels fresh and yet also like an homage to beloved comic book heroes, especially from the pulp era. A lot of offshoot histories. A little too long in my opinion. Although some was needed. A nice variation on mutant/superhuman stories. Certainly a recommended book to read. Hope the following books are as good. The characters in the story are fresh would've given five stars but thought the story lagged a little bit in the middle . Recommend this story for anyone young or old who still like superheroes. I enjoyed the humour in Armageddon Girl and the throw back to geek culture but the story itself lacked any real depth. Classic comic book origins story where the main character Christine is thrown from universe into another where superheroes rule and norms drool. Entertaining read, I liked the characters and story line. Looking forward to the next book. I'll follow the series until the end. C.J. discovered his obsession with making up crap and writing it down at the age of 6, when he wrote his first short story, back in the days when the Cold War was still on and the only mobile devices were the wrist watch and the walkie-talkie. He's been making up crap and writing it down for fun and profit ever since.